Tyrus Books is one of the more generous publishers I know. It feels as though, every time I turn around, they enthusiastically give away copies of their backlist titles, no strings attached, to anyone who happens to be online at the moment the request is broadcast. A few months ago, when a request for free copies went out, I decided to head over to their website and started sifting through the catalog. Up until that moment, though I had been following them on Twitter, I'd never owned or read any of their books. 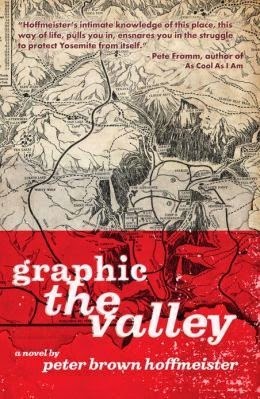 Their 2013 release Graphic the Valley caught my attention and within a few days, it was knocking on my front door. It's front and back covers refer to it as James Joyce-ian and a modern retelling of Samson and Delilah, and to both I say nuh-uh. No way. Don't let those descriptions throw you off because (one) a book could be one, or it could be the other, but there is no way any book could be both at the same time and (two) it's just so far from either that I'm actually confused by the comparisons. Hoffmeister's writing flows like melted butter off the page. It smoothly transports us from past to present, transitioning itself in time and place with ease. He uses his words wisely, concisely. And it is my impression that this intentional brevity creates a more passionate, immediate picture for his readers. On the surface, Graphic the Valley introduces us to Tenaya, a man-child who is born and raised in Yosemite. His mother and father, the only family he's really ever known. He's never left the Valley and only experiences the outside world through his interactions with the camp's seasonal patrons and the voluntary homeless "dirtbags" (his name for them, not mine) who set up temporary camp in the caves and natural lean-to's within the heart of the forest. What Tenaya knows of his people's history has been told to him by his father in the form of stories. He survives by scavenging bear-boxes, dumpster-diving, and living off the land. He is naive, though he believes in standing up for what is right and wrong. He is sentimental, for he desires to remain connected to his homeland while attempting to connect to the strangers who surround him. Tenaya is also incredibly heroic, though he doesn't really understand what it means to be a hero and is incapable of seeing how his actions create gigantic ripples in the world beyond his own. If you read a little deeper, you'll discover the struggles of a family desperate to fight for a history they believe is being taken from them; of the invisible impact corporate growth and greed can have on the lives of those native to the land; a contemplation on how far a person is willing to go to make right all the things they perceive as wrong. And ultimately how those perceptions, limited as they are through the small scope in which they are viewed, might actually tear that family apart. Hoffmeister pulls no punches as he forces his characters to admit the roles their lies and secrets and lust play in the fate of their own lives as well as in the fate of the Valley. And as the war against corporation growth begins to take human lives, those that are left behind must ask themselves, was it worth it? Are they still doing the right thing? I think what I enjoyed the most, as I read, was how Hoffmeister shone a light on the lives of those who are frequently misunderstood and sometimes entirely overlooked without coming off as preachy. It gives you an appreciation for those who choose to live off the grid. And more personally, it brought back to mind the friend I had back in high school who took off for a month with only a backpack and a bicycle and the expectation that he could survive off the land and the generosity of strangers. And damn if he didn't do what he set out to do. At the time, it was a way of life I couldn't and wouldn't understand. Now that I look back on it, I have to wonder... what did that freedom feel like? And once you'd gotten a taste of it, how difficult would it be to willingly go back to the life you knew? To face the bills and mortgage payments and 9-5 grind again? Graphic the Valley takes those questions and spins them around... what if that lifestyle was all you knew? Would you give up that kind of freedom, break away from it to live on the grid, like millions of others do, every day?